The problems of Modern Society have been diagnosed, hashed over and analyzed to the Nth degree. But who is putting forth any viable solutions that can have an immediate impact? This project is an attempt to muster all aspects of the Creative Source to Manifest one possible solution, based upon one man’s Art sense and wide-ranging Knowledge, based upon many Scientists, Researchers, Philosophers and Teachers much smarter than himself. At its core, theJobSpectrum™ is part Art Installation, part Participatory Survey Service. And that’s all it is, in its simplest sense. It’s an Idea that wasn’t possible even 2 years ago. But with the advent of the more and more powerful and vibrant Social Media that is permeating our now Global Civilization, something like theJobSpectrum™ can now not only exist, but can and will thrive, give us a way measure and value itself, influence how Society views itself, prioritizes itself, organizes itself, and motivates itself. And that just scratches the surface. Born from the contemplation of Art by its originator, the potential of theJobSpectrum™ can have multiple applications, which is one of the many ways it is so remarkable. From a solid money-making venture that creates a viable, vibrant database to the next world-wide phenomenon, that has a true Positive impact on the way we view our place in the Universe and how we interact with it. This is the potential theJobSpectrum™ holds. It will do this by infusing the Natural Laws of Mathematics, the plant kingdom, Sacred Geometry and ancient lost practices. Implementing these, into the way we think about and conduct business will lead to a more balanced, sustainable way to be – for all of us. Using a variation of the Lean Startup Model, the purpose right now is to Create Buzz, Generate Interest, get the word out. We will collect and build a Database of interested parties who want to participate in some fashion. What theJobSpectrum™ represents, through the application of Positive Thought Structure®, is a possible solution. A Keystone. A Bridge that can connect us to a more altruistic, benevolent, inclusive and dynamic future. Or at least help us gauge and measure it. At first, this will be the initial goal . 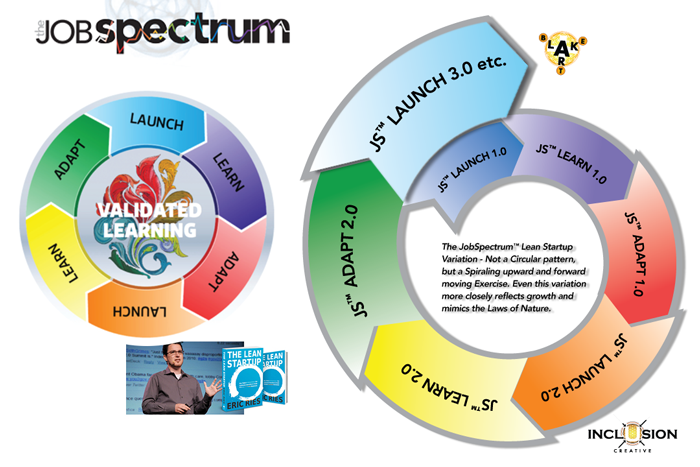 But as interest and excitement grows with the understanding of how theJobSpectrum™ can work, by applying the “Natural Business Models”, it will grow into a profitable and generous perpetual income generator for all of those who choose to participate.